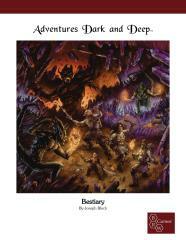 The Adventures Dark and Deep Bestiary is the third core rulebook for the Adventures Dark and Deep game, an expansion and revision of the original 1st Edition rules that defined the role-playing hobby for a decade. Based on Gary Gygax's original plans for expanding the game, Adventures Dark and Deep gives you new character classes like the jester, savant, mystic, and mountebank; new spells; a new combat system; new monsters; rules for weather and natural hazards; new magic items, and tons more. And it's all compatible with most old-school games, so you can use it with all your old and new adventures, settings, and supplements.